The Medford MailTribune opined last Sunday in opposition to Measure 39, the initiative to rectify the new land use abuse by government wherein local government, utilizing eminent domain, takes the private property of one person for the purpose of transferring it to another private person. In this instance, the MailTribune is wrong – both in its recommendation and its analysis. But let me digress a moment before highlighting their lapse in fact and logic. Measure 39 is the response to the United States Supreme Court’s decision in Kelo v. City of New London, in which the court ruled that the United States Constitution does not bar the city of New London, Connecticut, from using eminent domain to take private businesses and residences to transfer to a large developer for purposes of building a plant for drug giant Pfizer, Inc. The New London neighborhood was not blighted nor hazardous to the public – it simply did not produce as much tax revenue as it might if there was a large scale development on that same property. Unlike much of my conservative brethren, I do not disagree with the Supreme Court’s decision – although I find the result shocking and distasteful. The fact of the matter is there is nothing in the United States Constitution that limits the use of eminent domain for such purposes. The limitation on the use of eminent domain is singularly the responsibility of the legislative and executive branches of government – not the courts. These are policy decisions and the courts should keep their hands off. Since the Kelo decisions, 27 states have already moved rapidly to remedy Kelo with measures similar to Measure 39. In other instances the president (for the federal government, governors (for several state governments), and local officials (in a few municipalities) have acted to prohibit the use of eminent domain for such purposes. Measure 39 is Oregon’s opportunity to act since neither Oregon’s legislature nor Governor Kulongoski has seen fit to do so. It is that simple. This is a fundamental policy choice as to whether government should decide who is the best owner of real property – particularly if “best” is determined by which land owner will generate the most tax revenue for the government. This is clearly a choice between the have’s and the have not’s. In the Kelo case, Susette Kelo had owned her property for years. Paid the property taxes on it faithfully. Kept it clean and well appointed. But the amount of property taxes generated by Susette were miniscule compared to those that would be paid by a developer for a multi-million dollar research center, an upscale hotel/conference center and new high end homes. Two groups – the City of New London and the wealthy developers – derived a significant financial benefit at the expense of a lowly homeowner. That is the fundamental policy choice. Is your private property safe if the government wants to derive more revenue? Absent Measure 39, the answer is clearly NO. With Measure 39, the answer is clearly YES. The MailTribune is simply wrong. The Portland Development Commission has used condemnation at least sixteen times in its quest to accelerate “economic development.” Recently, Portland entertained a proposal to redevelop a portion of downtown Portland known as the Park Blocks. That proposal contemplated the city using its eminent domain authority to transfer the Park Blocks property from the current owners to the developers. In Keizer, Salem’s bedroom community, the city sought to use its eminent domain authority to push Bob and Marilyn Lowery off land that had been in their family since the 1`940’s in order to develop the massive shopping center area adjacent to Interstate 5. It has been used in the past and it will be used again in the future – and it will be used wherever local government wants. Finally, the MailTribune is opposed to a portion of the measure that would allow the landowner to recover costs and attorneys’ fees if a judgment turns out to be higher than the last offer of the government. Give me a break. Government routinely “lowballs” its offers in condemnation knowing full well that it costs tens of thousands of dollars to battle the government in court. If the landowner disagrees with the government’s offer, the landowner gets sued. Many landowners cannot afford to pay the costs to defend their property – win or lose. 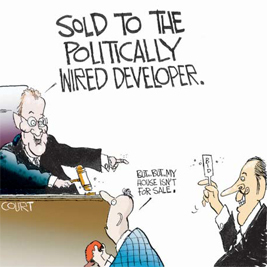 The court’s judgment reflects the “full market value” of the property. If the government forces the landowner to pay for the costs of litigation instead of offering the “full market value” then, of course the government should pay the costs and attorneys’ fees imposed on the innocent landowner. Here’s the easy way to make a decision. If the government shows up on your doorstep and tells you they want your property to transfer to someone else who might pay higher taxes, how would you react? I thought so. Then vote that way too.